Angry Birds Rio 1.4.4 Smugglers Plane Update: The Amazing and Entertaining Angry Birds Rio has been updated as Angry Birds Rio 1.4.4. Now Angry Birds Rio 1.4.4 is available for Free Download with addition of 15 new levels by which your Puzzle skills will be tested. 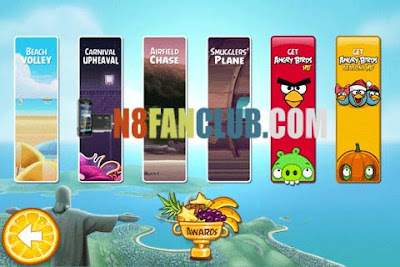 Angry Birds Rio v1.4.4 is compatible for Symbian^3 / Anna / Belle / Refresh / FP1 / FP2. Angry Birds Rio version 1.4.4 is an exciting game which you have been waiting for. In Angry Birds Rio, the real Angry birds are kidnapped and taken to the magical city of Rio de Janeiro. So now Angry Birds Rio had escape their Copter and Now they are ready to save their friends. They are now trying to save their Friends “Blu and Jewel”. Angry Birds Rio will pair the physics-based gameplay of the original game with unique twists based on the film. 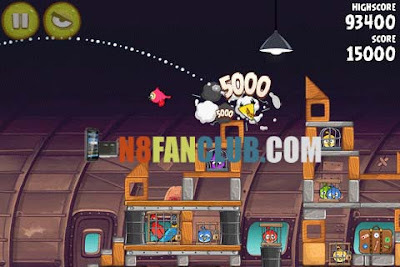 Now Angry Birds Rio v1.4.4 has thrilling 165 levels with Six exciting Episodes. Also special hidden Fruits are available to make this version of Angry Birds Rio more enjoyable. “Boss fight” available for examine the original skills of Angry Birds. The other task for Angry Birds is to kill the smugglers who have taken their friends. Main Features of Angry Birds Rio 1.4.4 are given below.